"The value of the Panasonic projector to the pastor is that it is much easier for him to communicate his message to the congregation. Having the Panasonic projectors with these 16:9 screens allows everyone to see everything as if they’re up front." The use of the cameras and Panasonic DLP™ projectors allow Van Dyke to display hymn lyrics and scripture readings as well as vivid images, enhancing the pastor’s sermon in real time. 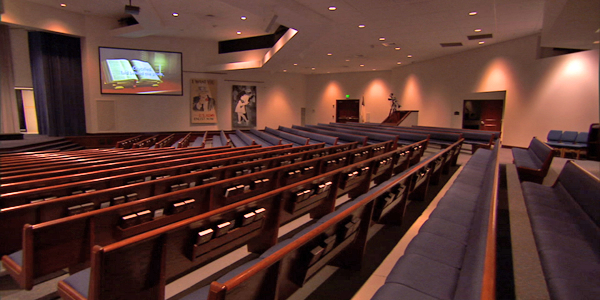 The video ministry at Van Dyke United Methodist Church in Lutz, Florida was less than a year old, and they wanted a format would use words and images to seamlessly communicate the message to the entire congregation, no matter where they were seated, and that also had the built-in flexibility to accommodate a growing congregation. The PT-DW7000U-K was the ideal solution. It puts out 6,000 lumens of brightness and up to a 4,000:1 contrast ratio in a 16:9 format. So even people seated in the very back of a large venue experience total immersion in the experience. The superior technology of the Dynamic Iris and Dynamic Gamma preserve brightness and help maintain a wide dynamic range for razor-sharp images. The added feature of IMAG, (Image Magnification) allows the flexibility of seamlessly integrating three different camera angles, making the viewer feel as though they are in the middle of the action. And, of course, the Liquid Cooling System increases reliability with a minimum of noise and allows for a unique, compact design. The use of the cameras and projectors allow Van Dyke to display hymn lyrics and scripture readings as well as vivid images, enhancing the pastor’s sermon in real time. According to Erik Reece, The Director of Video Ministries at Van Dyke, “Panasonic projectors have been very low maintenance, we haven’t even had to change the bulbs yet. And they’ve performed beautifully. I’ve always been extremely happy with the resolution. We project a 720p image, and they’ve always rendered that flawlessly. I know they are capable of more, that’s all were able to give them right now. The 7000 series projectors have added an exciting dynamic to the ministry of Van Dyke United Methodist Church by capturing all of the action on stage and making it visible to the entire sanctuary in the 16:9 format. Panasonic PT-DW7000U-K Series projectors are perfect for superior picture quality in an ideal 16:9 format ensuring high visibility in a large venue. Van Dyke used the PT-DW7000U-K with IMAG with the 16:9 format and whisper quiet Liquid Cooling System to greatly enhance the communication of the complete worship service to the entire congregation.